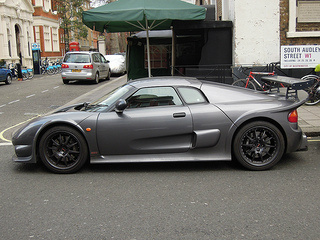 The Noble M400 sports car, introduced in 2004 and priced at $94,000, was designed as the track version of the M12 that was originally launched in 2000. Its name was derived from the simple fact that the figure of 400 referred to the cal's power-to-weight ratio. Specific changes from the M12 included an anti-roll bar at the front, stronger springs, improved shock absorbers, a racing harness, and adjustments to the seating position so that the driver was now aligned more centrally to allow additional headroom for wearing a crash helmet when racing. The front splitter was removed, and side vents were added behind the doors in order to improve air flow. It had a kerb weight of 1060 kg, although air conditioning was offered as an optioanal extra even though it would increase overall weight. It had a composite fibreglass body and steel space frame chassis, and was fitted with 330 mm drilled and ventilated discs all round. The interior was trimmed in Alcantara, and there was an adjustable steering wheel plus Sparco racing seats which could be moved and tilted both forwards and backwards. 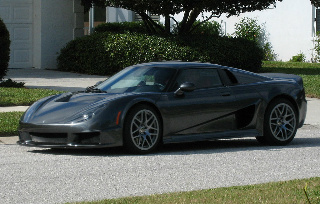 In total, 75 units of the M400 were built, with production ending in 2007. The M400 was powered by a modified 3 litre, 24-valve, Ford Duratec V6 mid-engine, positioned transversely, that was fitted with two Garrett turbochargers in which the original T25's were replaced by two larger T28's, with a maximum boost of 0.8 bar. As a result, it developed 425 bhp at 6500 rpm (redline at 7200), and 390 ft/lbs of torque at 5000 rpm, with most being available around 3000 rpm. Fitted with a Getrag six speed manual gearbox, and a compression ratio of 8.0:1, it produced a top speed of 187 mph, with a 0-60 mph time of 3.2 secs. 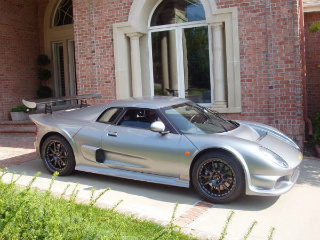 The US company Rossion, a.k.a 1g Racing, purchased the rights to the M400 in 2007 with the intention of producing a more luxurious version, designated the Rossion Q1 sports car. Using an unchanged power plant, the Q1 developed 450 bhp at 5800 rpm, and 390 ft/lbs of torque at 4400 rpm, and produced a top speed of 189 mph, with a 0-60 mph time of 3.1 secs. The body was redesigned with improved aerodynamics, plus the following additional features: upgraded engine control system, a rear diffuser and flat under tray, and electric windows. 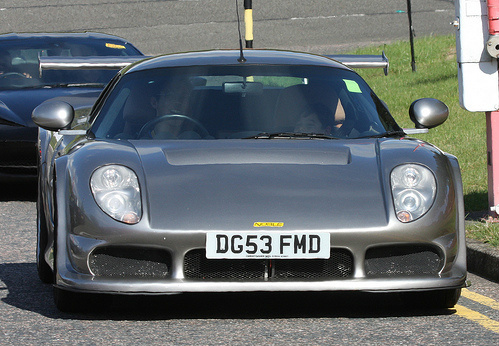 On the second hand market, a typical Noble M400 in good condition would command in the region of £45,000/$70,000.